Show you are a survivor and raise awareness at the same time with this Personalized Survival Ribbon Breast Cancer T-shirt. Give others hope with this Breast Cancer Shirt to keep them strong and to keep the hope alive. 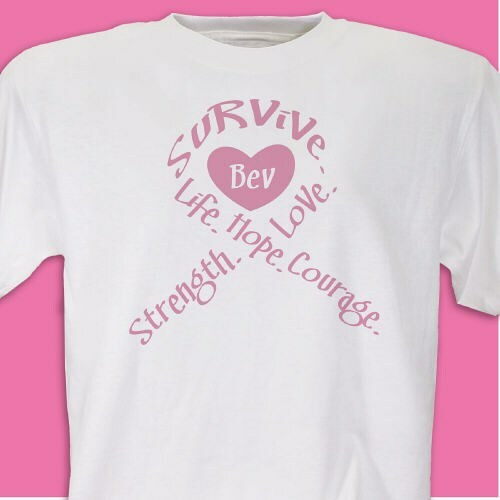 Our Survival Ribbon - Breast Cancer Awareness Personalized T-shirt is available on our premium white 100% cotton T-Shirt, machine washable in adult sizes S-3XL. Also available on Pink. Includes FREE Personalization! Personalized with any name. We offer many Personalized Breast Cancer Awareness shirts. These personalized shirts, which help the fight against breast cancer make great gifts. Also great for Charity events or Breast Cancer Awareness walks. MyWalkGear.com also has many additional Personalized Breast Cancer Apparel and Walk Gear for your special walking events. Each time a gift is purchased from our Breast Cancer Awareness line of personalized gifts, MyWalkGear.com will make a donation of 15% of the purchase price to help in the fight against breast cancer.